The third youngest Indian to climb Mount Everest. He achieved this feat at an age of 16 years, 11 months and 18 days. He broke the record set by Krushnaa Patil of Maharashtra who climbed the summit at the age of 19. Arjun Vajpai started his career as a trekker from the age of 10 when he went to visit his grandmother for a holiday. While most boys his age are busy targeting high scores in academics, Arjun Vajpai has lofty dreams elsewhere - quite literally. 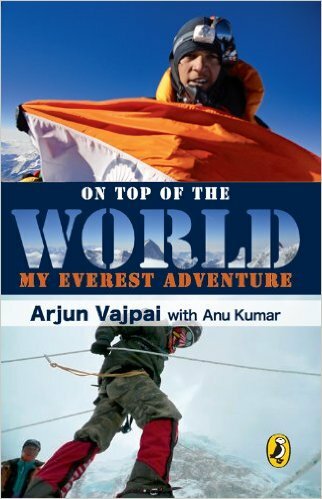 Arjun Vajpai was the youngest Indian to climb Mount Everest. He achieved this feat at an age of 16 years. On 20 May 2011, he became the youngest climber ever to summit Lhotse, aged 17 years, 11 months and 16 days. Arjun also became the youngest to summit Mt.Manaslu.The class 12 student who is the youngest Indian to scale Mount Everest is now all set to conquer Mount Makalu - a peak no Indian has managed to scale yet. For Arjun, getting this far has meant a lot of hard work, rigorous physical training and maintaining a sharp balance between academics and training. Arjun says, "I spent a month-and-a-half acclimatising to the cold climate. During my training period, I practiced yoga in order to increase my lung capacity. My body had to be ready to handle the strain of a two-month-long expedition of which the last five days, when I climbed the final summit, were the most demanding." Talking about his love for the mountains Arjun says, "The Mountain has always fascinated me! And it was indeed a proud moment for me to be the youngest Indian on top of the world. When I reached the top and looked all around, I saw the most spectacular view ever. No camera could ever capture this view - the Himalayas were below me and nothing obstructed my view. It was an awesome feeling to see the sun rise from below the eye level. I felt like I ruled the world!" Arjun believes in dreaming big and aiming high. 'The sky is the limit' is his favourite motto. But he also believes that one needs to put in a lot of hard work to achieve one's dreams. He wants to climb Mount Everest again and also hopes to conquer the world's seven highest peaks and go to the North and the South Pole. "My parents are very supportive but they also want me to focus on my academics. These activities have a short life. Only good academics can take you further. I want to join the Indian Army and am working towards a course at the National Defence Academy." Arjun plays football and basketball at the state level and Taekwondo at the international level. He has also competed in karate, swimming and skating at the school level.Arjun's expedition was eco-friendly and his team came back having collected around 26kgs of waste. He and his group collected all the waste they created during the journey and then disposed of it using bio-degradable techniques. There are 14 highest mountain peaks in the world which are above 8,000 meters. All these peaks have been climbed by only 28 persons in world, and there is no Indian in this list. Youngest person in this elite list is of 33 years. Three Pole Challenge: Mt. Everest, Unsupported Ski Expedition to North Pole and Unsupported Ski Expedition to South Pole. Youngest person to have achieved this is of 25 years. Seven Highest Peaks in the Seven Continents. Grand Slam: To complete all the above set of Challenges. 2012: CNN - IBN Young Indian Leader Award 2012 - given by Mr. Sachin Pilot. 2012: Times Now Amazing Indian Award 2012 - given by Mr. Janardan Dwivedi. "To book Arjun Vajpai as the speaker for your event simply complete the online form. For more information regarding any of the Sports Speaker on our roster contact Simply Life India Speakers Bureau on +91 8652835000 or speakers@simplylifeindia.com"